I forgot i had bought this 2 years ago and used 1 time and didnt know what it really was at first lol my original use was for editing pictures on instead of using a mouse pad and now im curious where can i find the help in how to use this for tracing etc to apply for vector work.. Hopefully someone has a couple links or suggestions ..Thank you in advance. "… my original use was for editing pictures on instead of using a mouse"
and , "where can i find the help in how to use this for tracing"
Fact is, it won't move you any farther ahead at all when you first start using it. time and practicing with the instrument. Use it in most, if not all, of your programs. between it and the mouse that you're so used to. wherever you prop the pad is another unnatural difference to overcome. Some folks have a hard time with this and set it aside at this point, unable to clear that hurdle. Hang in there and spend some practice time dialing in it's action with pressure and feel. tablet’s HotKeys and which ones are better used at the keyboard. possible and try to complete all the pen work together, at once. how you'd like. Make it feel as much like a real pencil, pen, or brush as you can. drag (friction) between the nib and the pad. Just keep practicing and tweaking till to get comfortable with it. IMO, those are the biggest hurdles with the tablet. Getting it to feel natural. After that, the tablet can definitly enhance abilities you already posses. It is indeed a 'better mouse' for drawing, painting, and photo editing. Thing is, those 3 processes lend themselves more to raster work than vector. Which is why I don't use the tablet as much within my vector programs. modifying basic geometric shapes/objects in vector, the mouse is my go to tool. Every project will have different requirments and everyone will have different workflows. This is just my workflow, you will need to figure out where the tool is most useful to you. Where can it save you time or help you render or manipulate and image better. It's proficiency with the software that allows the tablet (in the right hands) to shine. Otherwise, it's just a linear mouse. These attributes will surely improve with regular practice. I bought a fairly expensive Wacom tablet a few years ago and tried it out for about an hour before I suddenly realized you actually need real drawing skills to use one effectively (which I do NOT) luckily I was able to box it back up and get a full refund at best buy or wherever I got it. I determined that I can't draw as good as my 10 year old kid and never have had that ability. I've seen an add for the digital pen... Let us know how that works out. The Tablet has a place in Graphics work but, like many things, there's a learning curve. I don't know that it would be very helpful without artistic abilities. This is more like what I've got my eye on, goose. Just looking to justify the cost. I saw a guy using one of those one day and yeah they look awesome. If I did more actual drawn artwork I might have worked a little harder on learning the wacom because of the variable pressure pen which would translate into variable width stroke but for what I do it was easy to see I would be better off just sticking to what I was good at. My sister is an accomplished artist. She has done things like a city map of her town with all the attractions and various stores that they hand out at the visitors center and a few pictures on commission. My oldest daughter is also a wonderful artist like her aunt although she doesn't pursue it professionally but those genes just didn't manifest in my case. Hi there, I own a 21.5" IPS Drawing Tablet Monitor XP-PEN Artist 22E Pro. 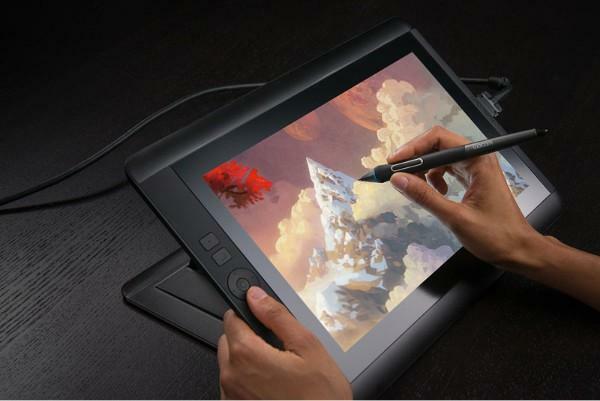 It's a screen tablet like a Cintiq 22HD , and it was around 500/600 USD when I got it a year ago. it works well with vector work. . you can draw directly on the Screen . The screen is fantastic. I had a bit of trouble setting it up, but not much. For some reason my computer didn't recognize it at first. I then reinstalled the driver, changed ports and then it worked. And again, the screen is fantastic. It's big precise （ Have some parallax ） and it responsive (no drag).